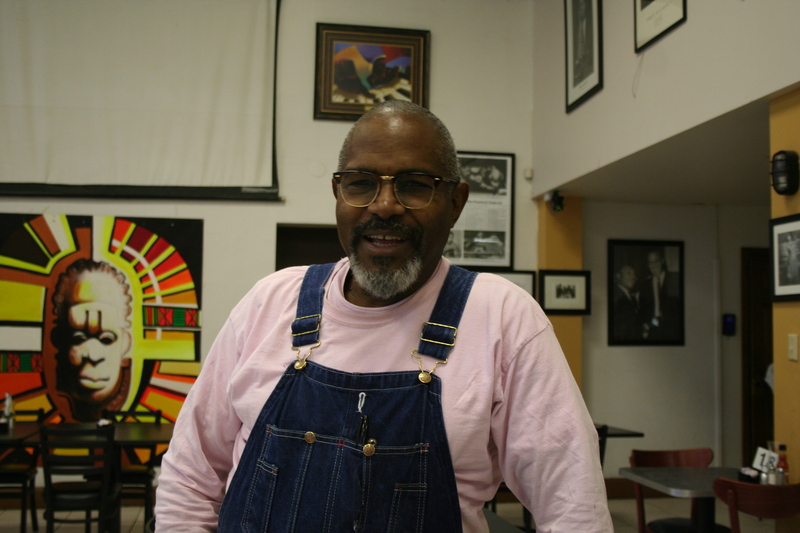 Amos Paul Kennedy sits in Coffee Makes You Black, 2803 N. Teutonia Ave., in Milwaukee’s North Division neighborhood. Kennedy, a printer who has a work of the same name (“Coffee Makes You Black”), is visiting the Milwaukee Institute of Art and Design (MIAD) as part of the school’s Creativity Series. But this isn’t his first time in the city. Where was home? “Well, Grambling, Louisiana, ended up being the home. So, that’s where we spent the 13 years, in Grambling. And, then, I graduated and I left,” says Kennedy. But, once he left, Kennedy realized what an immense advantage he’d been given, though he admits it wasn’t something he took full advantage of. It wasn’t only the education level of his teachers that influenced what Amos learned — it was also the personal attention. Because his school was a “lab” school, people majoring in education at Grambling would observe classrooms and do their teaching apprenticeship (student teaching) there. Because of this, for about 18 weeks out of the year, the student to teacher ratio at Kennedy’s school was about eight to one. Kennedy is the third of five children. He describes it a different way, though. “I am the most loved of all the children,” he says with a smirk. “When I was born, my father had a bachelor’s degree and my mother had a bachelor’s degree. But, one month after I was born, he felt that that was inadequate so he went back to get a PhD … because my birth was very important to him, you know. So, I altered his life,” he says. Kennedy went to school for four years and graduated with a degree in mathematics. After school, he worked for IBM for a few years — he can’t remember exactly how many anymore — and “kind of, floated around in corporate America until about 1990.” At 40, the man who had worked as a computer programmer for most of his adult life, decided to get out. While at Indiana University as an assistant art professor, Kennedy decided to make a statement. At the College Art Association’s annual conference, Kennedy set up a booth to attract “minority hire[s],” as he had been referred to. “No one had ever confronted that,” says Kennedy, who admits he could have gone about it in a more benign way, but that, if he had, it might not have had the same effect. “They showed up indignant but they left on my side,” he added, of the young black men. “I’m humble because I am humble. And people say, ‘How can you be humble and say you’re humble.’ I said, ‘I’m humble, I didn’t say I was stupid.’ I’m smart enough to recognize humility,” Amos says. “It just highlights how disconnected things are in this civilization and how it is more connected to entertainment than actual information,” he says. Did you find value in Amos’ story? If so, please subscribe to our newsletter; we publish the story of a different Milwaukeean every week.